The Cincinnati High School Boxing Team (CHB), one of only two official high school boxing programs in the country, was established in 1996 at Moeller High School but is now run independently of Moeller and is open to students from any school in the Cincinnati area. Our objective is to provide a safe and organized forum to learn Olympic-style amateur boxing. In prior years, CHB has had boxers win amateur tournaments such as the Regional Golden Gloves competition and compete in National Golden Gloves and the Junior Olympics. Amateur boxing is much safer than professional boxing due to the specific rules (emphasizing points rather than damage), fewer & shorter rounds and the use of headgear. In an average season the team consists of 25-35 athletes from approximately 15 area schools. 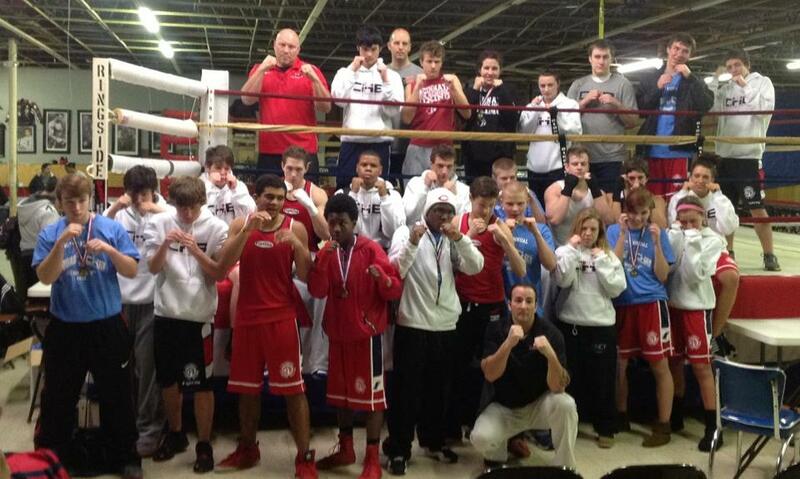 Boxers train alongside the University of Cincinnati Boxing Club and compete based on age, weight, skill & experience. Training includes strength & conditioning, boxing technique and sparring. Safety is our primary concern and coaches are present for all training sessions. There are no tryouts, all students, male and female, in grades 7-12 from any area school are welcome to participate. No experience is necessary. Beginning boxers are trained in the basics starting with stance and movement, defensive techniques, and instruction on how to land a full range of scoring punches. Athletes participating in other fall sports are welcome to join late when their season ends, as boxing is an optimal cross-training sport to improve core strength, cardiovascular conditioning, agility & coordination, as well as discipline and self-confidence. There will be in Information Session / Open House at Cincinnati Fitness & Boxing at 6:30pm on Oct 3. Practices will start Oct 9 and typically run every Mon-Thu from 4:00-5:30pm through mid-February. Cost for the full season is $350 and we are willing to work with students with financial difficulties. Off-season training during the spring and summer is also available. Competitions include one or two intramural shows in which team members compete against each other. The season culminates with a trip to Rochester, NY in February for our 15th annual competition against the Aquinas Institute boxing team. Opportunities are also available to continue training after the season ends and to compete in amateur boxing events and tournaments such as Golden Gloves. Competing is purely optional, the team is also open to those who are interested in learning the sport of boxing and training with the team, but do not want to actually compete.